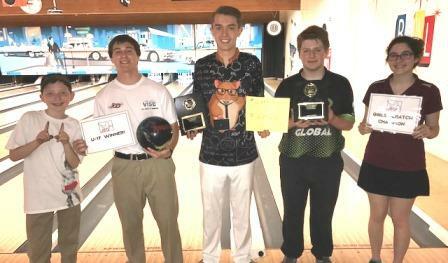 Jake Mullen and Tyler Coates put on impressive performances to capture titles in the 2017 Pac NW Invitational tournament, hosting by Longview's Triangle Bowl. Sixteen finalists in each division advanced to nerve-wracking triple elimination matchplay, creating do-or-die moments throughout the center for four breathtaking hours. By round eight only five scratch bowlers remained standing, with #3 seed Andy Herrmann enjoying a bye, while Tyler Boe eliminated AJ Schock, and Tyler Hogstrom finally handed Jake Mullen his first loss. In the next round Herrmann beat Mullen, and Boe beat Hogstorm, which eliminated nobody but essentially created semifinal matches with everyone now at two losses. In those matches, Mullen eliminated Boe, and Hogstrom eliminated Herrmann (who solidified Bowler of the Year with the third place finish), setting up the one game title match. Both veterans performed extremely well on the very demanding pattern in the title match. However, when Jake crushed a tenth frame strike, years of emotion poured out as he finally captured the elusive first scratch win, which he had come painfully close to earning, including the day before. Coates started the day needing a good performance to earn Bowler of the Year, and did way more than that, blasting to the top seed after qualifying. He got to his second loss by round six, but would never see the third, as he roared past previous day's champ Hilary Zuniga in round seven, giving Tyler DeLorm his first loss in round eight, and ousting Aidghan Ziegler in round nine, to set up a rematch against DeLorm, but needing to beat him twice to take the title away. DeLorm had been brilliant all day, but faltered late in the first game, which Coates took advantage of to win and force a final decider. Whether it was the loss or the extremely long day, DeLorm appeared to be out of gas in the finale, and meanwhile Coates was getting stronger, and he cruised in the finale to the win, his second career JBT title, and the $1,000 top scholarship prize. Coates wasn't quite done yet, as he then got to be a special guest star in the Tommie McNeal show, otherwise known as the U17 title game. Having had to wait a while for the match, Tommie was, well, Tommie in an entertaining win over Coates for the title. Regan Lorey finished off her impressive season with a win over Kelsey Abrahamsen for the Girls Scratch Invite title. Big thanks as always to the team at Triangle for another great hosting job. The top 20 points scorers now advance to the 2017 Touring Players Championship, the most prestigious event on the JBT calendar!